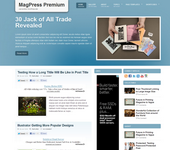 WideCore is a 3 columns flexible width WordPress theme by MagPress.com. This fluid width WordPress template comes with theme options, featured content slider, featured categories, Adsense ready, Twitter ready and many more. Hoping you can help me with my website… i keep getting the Tim Thumb error and cant get my head around the thumbnails not displaying. Could you please offer any guidance? great template. Could you tell me how to get the categories on the top where the “home” button stays? Use the custom menu. Go to wp admin > appearance > menus. My post not showing Thumbnail images? HOW TO USE CUSTOM FIELDS FEATURE? I done all things but nothing could be happen. 1. When creating a new post, look for the lower right corner. You should see a “Featured Image” section there. 2. In the “Featured Image” section, upload an image or select from gallery. Then choose “set as featured image”. Note: To avoid low quality images, always upload high-resolution images in the gallery. If the images doesn’t crop with the right sizes, I suggest you use the plugin “Regenerate Thumbnails” (download at http://wordpress.org/extend/plugins/regenerate-thumbnails/). The reason for that is because the new post-thumbnail feature only works fully for new image uploads. Hai. Looks like your hosting doesn’t allow timthumb usage. Try asking them to put your domain on modsec whitelist. As for the featured slider, its jquery is conflicted with your other plugin, try disable the ajax scroll plugin. so what will i do. Hai. Email me and I’ll send you the modified file that disable timthumb. Thanks. How to find Category IDs? Hai. On the Categories Panel, hover the mouse over the category name link and you will see the link address in your browser’s status bar (turn it on under View) or click the link. The last numbers in the link address is your category ID number. how to use featured slider images? bcoz my website not showing images with post. Hai. First, set it up inside the theme options and make sure the category id you chose has more 1 post in it. Thanks. how to change theme post image? Hai, Please open functions.php and look for “Get Standard Post Image”, under it change the post-default.jpg to whatever file name you upload into the images folder to use as default image. Thanks.